The OSNAP and OOI scientists at the 2017 Irminger Sea Regional Science Workshop, 8-9 November 2017, hosted by the National Oceanography Centre, UK. findings and future research. 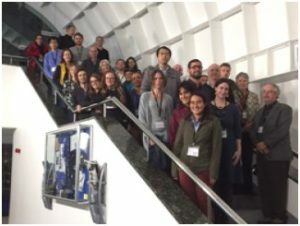 The 2017 Irminger Sea Regional Science Workshop was designed to give us time to present results from recent observations from OSNAP and the Ocean Observatories Initiative (OOI http://oceanobservatories.org/), and to develop plans for collaborative analyses, publications and sampling strategies. Workshops are less formal than conferences, and because this workshop was limited to less than 40 people there was much opportunity for conversation between all the participants. We had a good mixture of established and early career scientists, and for me that meant a chance to meet some new people, and to get to know better some people I’d met only briefly at previous OSNAP meetings. We spent the first day sharing short talks on our analyses – and often these were presentations of preliminary results, giving the meeting an air of excitement. Each talk prompted lots of questions as we related our own findings to those up on the screen in front of us. The discussions spilled over into breaks and many people commented to me about how useful those conversations have been to them – this is the reason why we hold these workshops. Some highlights among the talks were from OSNAP scientists – there isn’t room to list them all here, but here are a selection. Bob Pickart opened the talk session by showing us early results from his array west of Greenland – describing rapidly passing deep cyclones that may originate east of Greenland, and telling a great story about an instrument being torn off a mooring by ice, which was transported by the iceberg for a while before being found and returned by fishermen. Femke de Jong showed very interesting differences in variability at 3 closely-located mooring sites, concluding that controls on variability can change over small spatial scales. Johannes Karstensen presented some fascinating maps of mid-depth circulation derived from Argo float displacements, highlighting narrow and fast routes for exchange between the Labrador and Irminger Seas. Amy Bower, giving her talk remotely from the US, showed us more lagrangian information – this time intriguing tracks from floats that stay within the dense overflow layers and create a pattern of pathways quite different to our schematic maps. Isabela LeBras is exploring the slightly different seasonal cycles revealed by OSNAP moorings in the East Greenland Coastal Current and it’s larger offshore neighbour the East Greenland Current, and Peigen Lin showed us how the the inner current evolves as it travels around Cape Farewell. We finished the talks with a session on biogeochemical measurements on moorings, floats and gliders, and how changes in physical processes can impact ecosystems, reviving for some of us the idea that it would be very beneficial to build a biogeochemical programme associated with OSNAP. The second day was even more interactive. We started by brain-storming ideas for research, writing down any science questions that came to mind: big, small, obvious questions, crazy ideas. We grouped them into themes and those became the topics for small breakout groups for the rest of the day. This brought people with common interests together and encouraged everyone to share their thoughts and ideas. Our discussion groups were: biogeochemical and physical interaction, boundary processes and exchange with the interior, air-sea interaction, convection and re-stratification, ice and freshwater, and large-scale connectivity. We came away from this day’s work with new ideas, plans for new collaborative papers, and some new networks of scientists interested in specific topics. The conversations we started at this workshop will continue online and at future science meetings, and hopefully another workshop in a few years time. 1 Pings/Trackbacks for "The 2017 Irminger Sea Regional Science Workshop"